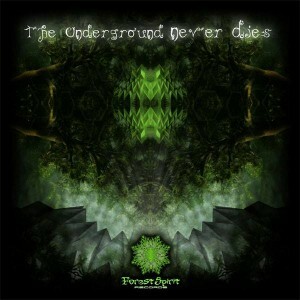 Forest Spirit Records is proud to present The Underground Never Dies, our latest compilation featuring 12 tracks from globally recognized artists compiled by label founder Dark Cygnus. Here we bring you the freshest forest grooves to take you on a deep psychedelic journey into mysterious realms with dark twists to keep the mind in touch with underground culture. While assembling this massive track list we had just one thing in mind: every terrestrial life form ultimately depends on the forests and jungle. Open your mind and take this trip into the unknown! Mastered by DigitalX with poetry by Mystical Voyager at Visionary Shamanics Records and artwork by Rod Herrera. MP3 Download | FLAC Download | WAV Download · Download count: 21,728. Awesome work guys!! Congratulations to all artists (esp. my beloved Meerkut, Fafazz and Spagettibrain) and for the really nice result by DigitalX! Amazing collection of super high deluxe darkforest , especially the first track from Shiibashunsuke !! Wow .. Mindblowing stuff here , Congratulations !! THANKS TO ALL FOR YOUR NICE COMMENT AND SUPPORT .. :) MORE RELEASES COME AT THE LABEL SOON, PLEASE STAY IN TOUCH FOR THE NEXT RELEASES. Excellent compiled ….. powerful music to get us into our inner forest ……….. thanks for sharing music embraces all producers and all the brothers listens. FOREST frequencies !!! Transcendence of the human mind!! !Euphony !!! Could go on and on !!! BOOM!!! este disco esta hecho con amor, verdadero amor. massive compilation >>> especially Zaiklophobias and Spagettibrains tracks excellented me !!! Ride The Snail <3 <3 <3 HAAHHHHHAAAAAA..!!! !